This delicious recipe is sponsored by StarKist. Tuna is one of those foods that has endless recipes. Because it is a versatile food, it can be served practically at any time of the day, for any meal of the day. Thinking of ways to incorporate more vegetables into my diet without having a big meal, I came up with Tuna Stuffed Cucumbers. They can be served as an appetizer before dinner, they be can share as hors d’oeuvres at a dinner party, or they can be a snack to take to school or work. StarKist Tuna Creations pouches are perfectly portioned for my stuffed cucumber recipe. Depending on the taste desired, I can use the Zesty Lemon Pepper, Sweet & Spicy or Ranch flavor. I do however, always use 2-3 pouches to really stuff the cucumbers and possibly have some left over for a sandwich or to eat with crackers. Cucumbers may seem like a hard food to stuff, but it’s actually really easy. I start by bringing all the ingredients I need to the counter top. 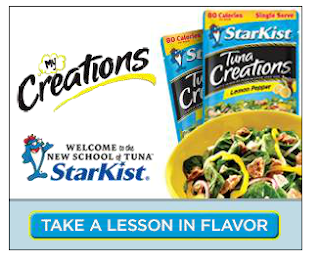 I begin by making the tuna mixture with my choice of StarKist Tuna Creations pouches, mayo, mustard, relish, dried cranberries, egg, green onion, and nuts. Once the tuna is mixed, I cover it and place it in the fridge to keep cool. I grab one decent sized cucumber and wash it. I peel the skin and wash it again. Next, laying the cucumber down horizontally, I slice it about an inch thick until the whole cumber is sliced. I turn over each piece of cucumber, laying it flat so that the seeds are in the middle. Very lightly, I then scrape the seeds out so there is a crater-like hole in the center of each piece of cucumber. Once all of the cucumber seeds have been removed, I place the cucumber on a serving dish. I then sprinkle the salt and pepper on the cucumber. You can sprinkle just a bit of lemon juice on the cucumber to keep it from turning brown. Next, I get the tuna from the fridge and spoon out enough of the mixture to fill each piece of cucumber. Lastly, I garnish with parsley. Tuna-stuffed cucumbers are a refreshing treat won’t take more than 15 minutes to make. What beats that? !